First quarter sales of PHEVs and BEVs were robust. Given that PHEV and BEV sales continue to be tiny in comparison with all light vehicle sales, the questions remains: Will PHEVs and BEVs become mainstream over the next few years? 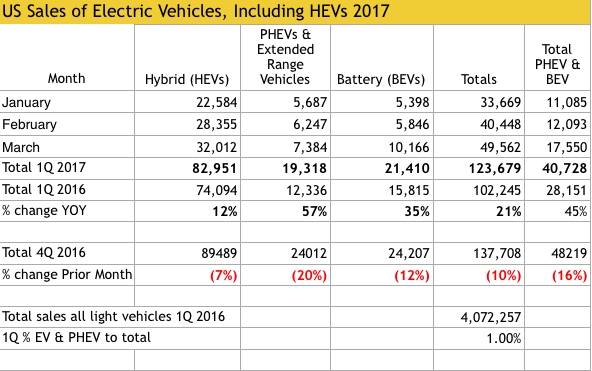 First quarter sales of PHEVs increased 57% year over year, while BEVs increased 35%. However, several important issues need to be resolved, and there is a strong likelihood they will be resolved over the next two years, between now and this time in 2019. How well will moderately priced BEVs fair in the market place? Both Tesla and GM are on the verge of introducing moderately priced BEVs, the Model 3 by Tesla and the Bolt by GM. These vehicles, with an MSRP of $35,000, are assumed to be competitive with comparably sized traditional vehicles. Will Tesla, with the introduction of its Model 3, be on the road to profitability? Or will it become apparent that Tesla’s business model will fail? Tesla has yet to achieve profitability, has received over $400,000,000 from its sale of California Zero Emission credits, and has been bolstered by debt that is coming due over the next few years. Will federal tax credits be eliminated? The $7,500 federal tax credit will reduce the cost of moderately priced BEVs to below $28,000, which could make them attractive for consumers. Will foreign BEV sales, primarily in China, increase to the point that Tesla, GM and Ford can economically justify BEV and PHEV models? Will fleet mileage requirements be increased from today’s 26 mpg, to 54 mpg in 2025? The Obama EPA rushed through efforts to lock-in the 54 mpg requirement, but it appears as though the EPA will readdress the issue. A reduction in gasoline mileage requirements would reduce the need for manufacturers to sell BEVs and PHEVs to meet average fleet mileage requirements. Will California continue to receive waivers for environmental rules it wishes to implement that are more stringent than federal regulations? BEVs are vehicles powered entirely by battery power. PHEVs use the battery to travel the first 35 miles, then switch to an internal combustion engine to extend its range. HEVs are essentially battery-assisted vehicles that use the internal combustion engine to power the car. Batteries don’t provide the motive power for the vehicle. The media often includes HEVs in its analysis of electric vehicles. Larger HEV sales distorts the actual impact of battery-powered vehicles. Range anxiety has been an important factor in consumer acceptance of BEVs. The Nissan Leaf has suffered from consumer concerns over being able to recharge the vehicle on longer trips. It’s entirely possible we will see a bifurcation of the EV market, with PHEVs becoming predominant. Rhetoric will no longer determine the fate of PHEVs and BEVs. Actual results should finally prevail. Musk visits everyone who counts including Trump. Tesla is Musk. When Tesla becomes Tesla we will find out if it can succeed. Getting to 500,000 cars is the next step. But, that number and those margins make it highly unlikely to succeed. If the unfair credit I’m helping (unwillingly) to underwrite goes away…Tesla is toast. Thanks for your comment. Tesla has a tough row to hoe. Yes. But, he has a lot of money to buy many hoes. Nice post.. explained very well..thank you!